The Schnoodle is a cross between a Schnauzer and a Poodle. Any of the three recognized sizes of Schnauzer or Poodle may be used to produce a Schnoodle. Poodle crossbreeds are meant to produce a dog with mixed traits and the Poodle’s signature nonshedding coat. As a crossbreed, the Schnoodle is not eligible for registration with purebred registries such as the American Kennel Club, but it can be registered with the American Canine Hybrid Club. The Schnoodle is not considered a purebred because it doesn’t ‘breed true’, meaning that it doesn’t display a consistent set of characteristics. Some breeders produce Schnoodles by crossing a purebred Poodle with a purebred Schnauzer (called a first generation cross), but others allow crossing Schnoodles with Poodles or Schnauzers (called a backcross), or other Schnoodles (called a multi-generation cross). Different crosses can result in different characteristics. Like other ‘designer breeds’, the Schnoodle has seen a recent surge in popularity, even Hollywood celebrities such as Claire Danes and Dakota Fanning have succumbed to the Schnoodle’s charm and found the need to pick one up. The Schnoodle can vary substantially in height and weight as there are three recognized sizes of both the Poodle and Schnauzer—Giant (Schnauzer), Standard (both), Miniature (both), and Toy (Poodle). A Schnoodle is sometimes subclassified as a Giant Schnoodle, Standard Schnoodle, Miniature Schnoodle, or Toy Schnoodle. The Miniature Schnoodle is most common at 11-16 lbs (5-7 kg). The Schnoodle may have a rough and wiry coat, like the Schnauzer, or a soft Poodle coat, or any variation in between. Some have alternating patches of soft and coarse hair; coarse on the back and soft on the top of the head is common. There are a wide variety of possible colors, including black, brown, grey, white, apricot, or a mixture thereof. Common mixes include black and white, sable, and ‘phantom’ (black and tan like a Doberman Pinscher). Puppy Schnoodles in the same litter may have coats of different color and texture. The Schnoodle sheds little or not at all. The Schnoodle has the Poodle’s intelligence and the loyalty and devotion of the Schnauzer. It is alert, loving, and playful. The Schnoodle makes a good companion and family pet. It is smart enough to determine when you’re preparing to leave, which will cause it to complain. Schnoodles may tend to bark frequently or dig if not trained otherwise. The Schnoodle has the Poodle’s intelligence and the loyalty and devotion of the Schnauzer. It is alert, loving, and playful. The Schnoodle makes a good companion and family pet. It is smart enough to determine when you’re preparing to leave, which will cause it to complain. Schnoodles may tend to bark frequently or dig if not trained otherwise. The Schnoodle gets along well with children, strangers, dogs, and other pets. The Schnoodle is a typically happy breed which enjoys being with its family. You can find Schnoodle puppies priced from $250 USD to $2200 USD with one of our credible breeders. Browse through our breeder's listings and find your perfect puppy at the perfect price. The Schnoodle gets along well with children, strangers, dogs, and other pets. The Schnoodle is a typically happy breed which enjoys being with its family. The Schnoodle requires only a weekly brushing and grooming a few times a year. Some longer hair is typically left on the face. Ear hair should be trimmed occasionally to prevent ear infection. Bathe only as necessary. The Schnoodle has a lifespan of 12-16 years. Some have allergies. The Schnoodle may require a special diet; consult your veterinarian for information. The Toy Schnoodle may have dental problems which can be prevented by frequent tooth brushing. Like other hybrids, Schnoodles tend to have fewer health problems than purebreds (known as ‘hybrid vigor’). The Schnoodle is energetic, intelligent, and eager to please, making it easily trained. Schnoodles can learn to compete in flyball, dog agility, and other dog sports. The Schnoodle enjoys walks. Larger Schnoodles require a substantial amount of exercise such as a daily jog; smaller Schnoodles can have a lot of their needs met by indoor play. Schnoodles enjoy fetch and tug of war. Many like to swim. Schnoodle Puppies for Sale - Shipped Worldwide! Finding the right Schnoodle puppy can be dog gone hard work. PuppyFind® provides a convenient and efficient means of selecting and purchasing the perfect Schnoodle puppy (or Schnoodle puppies) from the comfort of your home, 24 hours a day, 7 days a week. Take advantage of our PuppySearch or leisurely browse our directory of hundreds of dog breeds, Schnoodle dog breeders, Schnoodle dogs for adoption, and Schnoodle puppy for sale listings with photos and detailed descriptions. Some Schnoodle puppies for sale may be shipped Worldwide and include crate and veterinarian checkup. Many Schnoodle dog breeders with puppies for sale also offer a health guarantee. 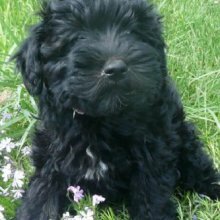 With thousands of Schnoodle puppies for sale and hundreds of Schnoodle dog breeders, you're sure to find the perfect Schnoodle puppy.